We develop a fast parareal finite difference method for space-time fractional partial differential equation. The method properly handles the heavy tail behavior in the numerical discretization, while retaining the numerical advantages of conventional parareal algorithm. At each time step, we explore the structure of the stiffness matrix to develop a matrix-free preconditioned fast Krylov subspace iterative solver for the finite difference method without resorting to any lossy compression. 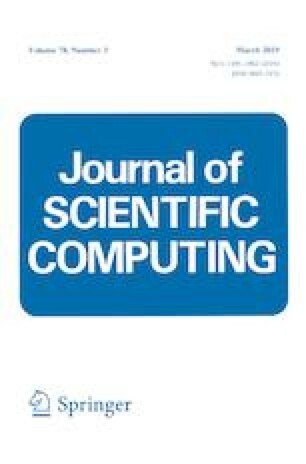 Consequently, the method has significantly reduced computational complexity and memory requirement. Numerical experiments show the strong potential of the method. This work was supported in part by the OSD/ARO MURI Grant W911NF-15-1-0562, by the National Science Foundation under Grants DMS-1216923 and DMS-1620194, by the National Natural Science Foundation of China under Grants 11571367, 91130010, 11471194 and 11571115, by the Shandong Provincial Natural Science Foundation under Grant ZR2017MA006, and by the Fundamental Research Funds for the Central Universities under Grant 18CX02044A. The authors would like to express their sincere thanks to the referees for their very helpful comments and suggestions, which greatly improved the quality of this paper.